The annual festival features music, entertainment and family fun. Photo courtesy of the Wapakoneta Chamber of Commerce. People participate in a race downtown. 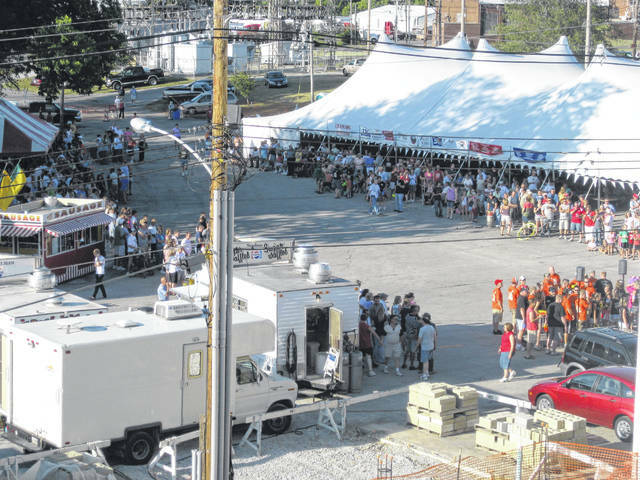 WAPAKONETA — The 49th annual Wapakoneta Summer Moon Festival began Thursday and runs through Saturday downtown and at the Armstrong Air and Space Museum on Saturday and Sunday. The Summer Moon Festival is a community event that celebrates hometown hero Neil Armstrong and the Apollo 11 moon landing and walk. The event brings approximately 3,000 to 4,000 people to Wapakoneta every year. “Next year is a big year, the 50th, since he’s been on the moon,” said Melissa Carlin, director of the Wapakoneta Chamber of Commerce. The annual festival started Thursday night with bed races on Perry Street, kids activities opening up and entertainment. One new event has been added from 5-9 p.m. Saturday and Sunday, the Lunar Launch, which is a zipline experience for the whole family. “We are bringing a 300 foot zipline dual zipline in on Auglaize Street. The cost is low, only $5 a ride because we want to make sure everyone gets an opportunity to ride it. We are pretty excited about that. Children can ride it too. There is a height limit, but if child meets height requirement, they can ride. What’s great about the Lunar Launch is that it’s going to hit children, teens and the adults. So it’s something for everyone. I tried to find something for each age group, which is really hard to do, but that zipline is going to do it. It’s Vegas style,” said Carlin. There are canoe races, wiener dog races, kids activities, entertainment and food and beverages. Events start Saturday at the Armstrong Air & Space Museum, kicking off at 8 a.m. with a 5K. Two astronauts, Don Thomas and Robert Springer, will help kick off the Run to the Moon 10K, 5K and 1-mile run. The astronauts will then give special presentations at 2 and 3:30 p.m. in the museum’s Astro Theater. Outside the museum there will be entertainment for all ages which include the Boonshoft Museum of Discovery’s Animals Alive program, Imagination Station; “Star Wars” characters, the “Lost in Space” robot, the Moon Pie eating contest and kids trivia. On Sunday, activities include the Toledo Zoo’s Zooper Challenge program, magician Russo’s Bent Reality show, and at 1 p.m. astronaut Don Thomas will speak. The festival closes out with the Lima Area Concert Band performing at 7 p.m. in the pavilion. https://www.limaohio.com/wp-content/uploads/sites/54/2018/07/web1_wapak-summer-moon-festival-1.jpgThe annual festival features music, entertainment and family fun. Photo courtesy of the Wapakoneta Chamber of Commerce. 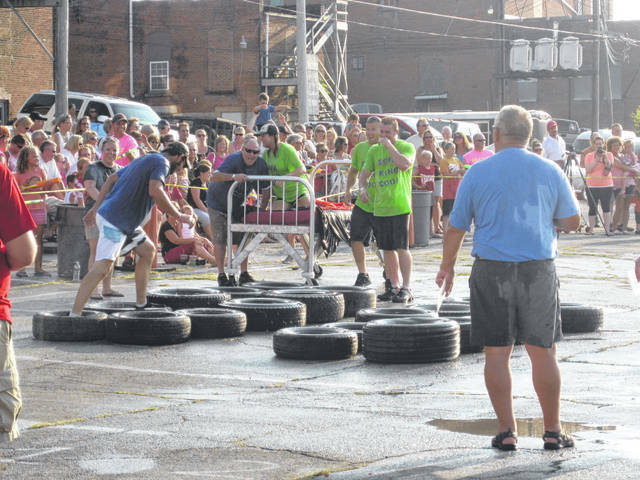 https://www.limaohio.com/wp-content/uploads/sites/54/2018/07/web1_SummerMoonFestival-9-.jpgPeople participate in a race downtown. Photo courtesy of the Wapakoneta Chamber of Commerce.